This issue we've been chatting with photographer Doug Chinnery, a very talented photographer who works across a variety of styles. Hope you like.. Yes, I have had those moments where my mind has cleared and a new focus has emerged. The first occurred several years ago soon after I acquired my first DSLR. I took a portrait of a friends young son, he was crying I and I was trying to cheer him up by messing about with the camera. One shot had a massive impact on me, and his parents. Everything had come together, and the picture was by far the best I had ever taken. It made me realise that by working the camera and experimenting I could create strong images rather than 'snaps'. The second I would pick as a major epiphany for me involved a website rather than a camera. I came across the website of Michael Kenna and was quite simply dumbfounded. I had never seen images like those he creates. So much had an effect on me. His use of black and white to simplify his images and focus attention on shapes and forms, his use of the square aspect ratio his camera gave to constrain his compositions and again simplify the scene. I was also very taken with his images made at night to give very long exposures and the way this revealed the world and the effects of time on the landscape. I think it is from him I have developed my love of the square image and the use of symmetry in my compositions. Like just about everyone it seems, I was given a plastic Kodak Brownie as a kid and remember making images with it on school trips and holidays when I was probably eight or nine years old. I then progressed to what has become a bit of a cult camera these days, a Russian Lubitel 6 x 6 cm 120 Film Camera and used that for years. Focusing was nigh on impossible and I rarely shot at anything other than f8 and 1/125th second, purely because I had no idea what I was doing! When I got married Elizabeth bought me my first SLR a Canon film camera which I enjoyed using but like many men in the early years of marriage photography faded into the background. Then years later I saw the emergence of digital technology. When Canon released the 350D I decided it was time to jump in and it was this camera that helped me make the first images I was able to sell. You experiment more with different styles and techniques than most photographers (and master many of them almost immediately too) is this part of a search for your own style or is this experimentation actually your style? I have a big problem with this, a battle rages inside me. I am quite an organised person, I like things to be in place and everything to be orderly. So I look at photographers I admire and read their writings and they all seem to have developed or are developing a style. Their websites have a flow, a 'look' and an orderliness and this appeals to my nature. The issue is I find myself drawn to many different styles of photography and can't help myself from experimenting with them. This is why I hesitate to describe myself as a 'Landscape Photographer'. Certainly, my first love is the landscape and most of my images are made in classic wild locations using the tools and techniques that most landscapers use. I also as a professional photographer have to have a commercial head and my customers mostly want classic landscapes in fine light, so this has to remain part of my output otherwise the mortgage doesn't get paid. However, I also love more creative images. I love blur and ICM (Intentional Camera Movement). I find myself fascinated with the effects achieved with toy cameras, lensless cameras, Holga's, Lensbabies and textures. I find this genre of photography far more creative and satisfying than classic landscape photography. Don't get me wrong, if I am out on the hills or by the sea and see a stunning composition or wonderful light I am as excited as anyone making classic images. But there is something more creative and artistic in making an image that can't be replicated, that is more abstract - it gives me an outlet for my desire to make 'art'. So, going back to your question, is this part of my search for a style or is it my style? A year ago I would have said I was searching for a style. I really wanted to have a 'look' to my work which would perhaps make people think "that's got to be one of Chinnerys images". I had a dream of a coherent, balanced website portfolio which showed a specialism in one style of work and a nice orderly look to it. But now I have come to the conclusion its not going to happen. I can't leave classic landscapes behind. I can't stop experimenting so somehow I have to reconcile the two. Digitally I am a Canon user. I have two 5D mk2's,a 5D Mk1 and a 1ds mk2. I carry a range of lenses, 16-35mm f2.8 L, 24-70mm f2.8L, 70-200mm f2.8 IS L, 24mm mk2 L TSE, 45mm TSE, 50mm f1.4, 100mm f2.8 L Macro and the 1.4x Extender. In just the last couple of weeks I have finally ventured into film photography. 4 x 5 format film has been eating away at me for the last couple of years but I have resisted. However, two events ( more epiphanies?) occurred in a single week. I had a professional photographer on one of my seascapes workshops and he introduced me to a lenscap pinhole adaptor for his Nikon DSLR. I was mesmerised and had to exercise great self control to continue teaching the group and not to get utterly engrossed in playing with it. When I got home that night I ordered one for my Canon. The same week I also came across the website of Steve Gosling and was awestruck by his lensless landscapes. This was the final push I needed to get into film. So I have ordered an old Russian Zenit 35mm camera which has been converted to pinhole as well as a Noon wooden pinhole camera from Poland which I am waiting to be delivered. Not satisfied with that I have also bought on EBay a Soviet Kiev 6 x 6 format camera (I can't afford a Hassleblad to follow in the footsteps of Kenna just yet but the Kiev is a copy, affectionately known as a Hasslebladski, so it might satisfy my craving for those square film images for a while) and I have ordered a plastic toy camera from the 1960's to experiment with - along with a load of expired film. I have little idea what I am doing and this is so new I haven't had any film developed yet but it is very exciting. But as for using my DSLR and lenses for classic landscape work. I have found myself of late veering away from using wide lenses. Looking particularly at the work of Charlie Waite, I was drawn to the way he seldom works 'wide' but still manages to capture the simple beauty of the landscape without the distortion of wider focal lengths. I have recently started working with tilt and shift lenses using a 24mm and 45mm as almost exclusively my landscape lenses. Their sharpness and wider apertures whilst still giving superb depth of field makes them so good for landscapes. I can see me making a move to using prime lenses exclusively in the near future - once you experience their sharpness and clarity it is hard to use zooms again. From the early days of your work you have used textures in your photographs (combining textural photographs with straight photographs). Can you tell me a little about what the inspiration for this was and give our audience a few tips? To be honest, I can't remember the first time I became aware of Photoshops ability to meld images together using a base image and then overlaying textures on top and blending them in such a way that the original image remains visible but it becomes affected in texture, tone and colour by the textures applied. I have built up an very extensive library of several hundred textures. Many I have made myself photographing walls, sheet metal, stone, lichen, wood and so on and others I have purchased from people specialising in producing quality textures. It only works with some images and you have to be prepared to experiment extensively. You can't view it as a way of rescuing poor images, composition and light are still very important. You also have to know when to stop working on an image, it is very easy to go too far. I love the creative aspect of texturing, you are making something truly original and coming up with a design satisfies that inner creative urge I have. As for tips, there are four blending modes in the layers panel you should will use mostly, Soft Light, Overlay, Screen and Multiply. Experiment with each on each texture you apply and then vary the opacity of the layer to tone down the effects of some layers. Also be prepared to desaturate some layers to use the texture but not the colour. I think it would be fair to say that it’s obvious that Chris Friel is a big influence - who else has been a major influence on your photography? Agreed. Chris has been a big influence on me. I love the way he breaks all the rules and is also not too interested in if people like what he does. He just enjoys experimenting. He sees the world differently to most of us and reveals his view through his images. Thats not to say I like everything he does but I think he is one of the most creative photographers working in the UK today and he deserves much more recognition and exposure. I have also been influenced by American black and white photographer, Cole Thompson, which is ironic because he has a philosophy of not looking at the work of others in an effort to preserve his view of the world. He feels that isolating himself from the work of others will lead to him being creatively original. I don't agree but respect his position and you have to say looking at his work that it is highly original. His images of Auschwitz are haunting and his work on tall buildings is very creative. I love his 'Harbinger' series of lone cloud images, which inspired me to take the shot which won me a Judges Choice in last years LPOTY. I am in awe of the work of Susan Burnstein and her images made from home-made cameras - so evocative and ethereal - something I am striving for in my creative work. I have also recently discovered the work of Alexey Titarenko whose images of people in Russia are spellbinding. 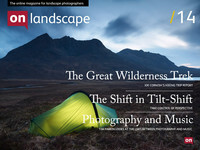 Finally, I have to mention Charlie Waite. Everyone I speak to about him who have met him agree he is a thoroughly nice guy. No airs and graces, just a passion for the landscape and for encouraging the photography of others - a real gentleman. His images, especially when seen printed, are stunning. His attention to detail, his control of the camera and the graphic compositional tools he uses really move me. No super saturated colour for him or gimmicks, just really well composed, gentle landscapes. if I could be half as good as Charlie I could die a happy man. I guess many photographers have a hard time isolating one favourite image but just now, and since the day I made it, I have one image which for me is the best I have made. I called it 'Three Birds' and took it in the winter of 2009/10. It is square, which is my favourite aspect ratio, the composition is simple and symmetrical (except the birds) and I by chance got the shutter speed just right to blur the birds enough and caught them in just the right place in the frame - a 'decisive moment' image for me. I also love the muted colour palette and the fact I made it just a couple of miles from home. As things stand for me now I find it hard to imagine taking an image which will give me more pleasure. I keep trying but haven't got close yet. I also quite like it that when I show people the image and describe it as the best image I feel I have ever made almost without exception they don't get it. It appeals to me that I seem to be the only one who admires it. Picking one or two more favourite images becomes much harder. Like many photographers, I find they are often images made recently. Images made some time ago which I loved at the time I have looked at so much they now lose something. If you pressed me it would be my image made at Saltwick bay of three rocks taken before sunrise using a long exposure - symmetry again, simplicity again and I do like the blue/grey end of the colour palette. My third choice would, interestingly, be one you have chosen for this article (incidentally, I am fascinated by the images you have selected, some I cringe to have used to be honest, others I really like but have not had much recognition elsewhere). It is an image of yellow grass amidst pine tree trunks made up in Scotland near Poolewe. I had been taking an image of Inverewe gardens for the National Trust for Scotland and then we went for a walk in local woods with our dog Stan. I came around a corner and the grasses and trees just made me stop and stare. I spend half an hour composing and making images and have loved them from the first - but you are the first person to home in on them as interesting. You are just putting on a gallery show - tell me a little bit about it and what is involved in putting one together. Yes, I have my first solo exhibition. It begins next Saturday (and I will be there all day so I would love to say 'hi' to GB Landscape readers who can pop in). I am the first guest photographer exhibiting at a new gallery devoted to photography. The gallery, called the Image Gallery, has been opened by photographers Pete Bridgwood (who writes a monthly column for Outdoor Photography magazine) and his friend and photographer Chris Upton. They will have a permanent and changing exhibition of their own work which takes up two of the three rooms in the gallery space and the third room is devoted to invited photographers who will be able to hold their own exhibitions. My exhibition is entitled 'Time Passing' and this reflects the fact that most of the images have been made with exposures of one second or longer, showing the effect of time on the landscape in way the eye cannot perceive. One or two images have been taken with shorter exposures but reflect time passing in other ways. I have been astounded at how much work is involved in selecting images, printing them, framing, mounting, packing, pricing, and all the other myriad tasks that need to be done. the cost has also come as a bit of a shock. I hope I sell some images to help recoup the expense. I have learned a great deal from the process, especially about the need to be very self-critical when selecting the final images. I have also hit the wall of indecision I spoke about earlier - should I exhibit purely commercial 'nice' landscapes or should it be an exhibition of more creative work which would likely not sell as well? In the end I have let my head and heart come to a truce and have devoted some space to commercial images which I hope will pay the bills while still finding room for some of my 'marmite' images which people will love or hate. I am excited and apprehensive to see what response I get, particularly to these creative works. Also, knowing that many fine photographers who make better images than me and are better at printing and presenting their work than I am will be coming along is quite an ordeal. I am expecting to be able to identify photographers browsing as they will no doubt be pressing their noses 3cm from the glass to check for sharpness and focus!! I plan to write an extensive article on staging an exhibition in the hopes it will help others with theirs if they get the chance to put on a display. Until last summer I didn't print any of my images. All printing was done for me by Loxley in Glasgow (and I still use them for large prints beyond A3+) However, I attended one of Scott Kelbys seminars on Photoshop and was so impressed with his results from his Epson printers that I took the plunge and ordered a Colormunki calibrations system (superb) and an Epson R2880. Once set up I have never been less than delighted with the results I am getting. The images come out so close to what I have on screen and being able to use fine art papers with ICC profiles is great. I also use Nik softwares output Sharpener and the results are superb. So all of the printing for my exhibition is mine. I must say Pete Bridgwood prints all of his own images and he gets exceptional quality from his Epson system (and his printer is much larger than mine so he can show some really big images) and I am sure when mine are hung they may not be quite as good as his, but I am very happy with them. I can't believe I shied away from printing my own work. There is nothing like seeing an image printed, it is so much better than a screen display. I am now addicted to printing and the walls of my house are very quickly filling with my work. I now also print for other photographers and am starting the design of my 2012 calendar as I have bought a pro binding machine so I can make my own and calendars for other photographers. I just wish the Epson K3 inks, although superb, were cheaper. I believe you are experimenting with film and pinhole photography - what sort of plans do you have and how are they going? I have touched on this, but yes, I am just venturing in to film. Already I am equally enjoying and being frustrated by the lack of immediate feedback from film. I can't wait to see the results. If I can produce pinhole landscapes of the quality Steve Gosling is achieving I will be very happy. I also want to get to grips with the Kiev 6x6 camera and try some night photography along with my minimal landscapes. I realise there is a huge amount to learn about film and how it behaves, but I am keen to immerse myself in it. Photographer Paul Morton was telling me how he has got rid of his DSLR system and gone into medium format film photography as he feels his education in photography is lacking as he never worked in film and I can now appreciate that view. I can't ditch the DSLR (and don't want to) but I think trying to master film will make me a better photographer. I want to experience what all you medium and large format lads go on about - that slowing down and becoming more considered in my compositions. I also hope it will deepen my understanding of light. Having listened to and watched Joe here on GB Landscapes, I have come to realise I just don't take enough time in the field over my compositions. I need to slow right down and think it all through. Joes intense attention to detail has really come across in his tutorials and I can see now his images are so good because of this. I can see me delving further into film by getting a 5 x 4 camera (I know that would please you, Tim!) I am still frightened by them and feel I need to understand film as a medium first, but am excited by the prospect. I have been thinking of booking one of your workshops with Dav where you introduce people to LF photography - I think they are a great idea and I know I could learn a lot from you both about film use and composition too. I would have - Paul Morton & Joe Rainbow from Flickr. I think Pete Bridgwood would have some interesting things to say. I think you have featured Tim Smalley recently? and you plan to talk to Steve Gosling I think? Thank you for interviewing me, Tim.